BoomersGirl Designs: Layout: "Hanging Around"
This is Gabriel's layout from our trip to Lakemont Park last year. 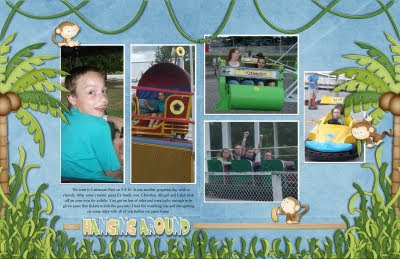 I loved the cute little monkeys and even though it's a little more kid-like, I thought they worked well for the layout. Digital Kit: "Monkey See, Monkey Do" by CRK.